I'm not great at doing my own hair. I can never get it as smooth and beautiful as the salon stylist, but I've mastered the messy bun. With a good dress and a dark lipstick, you can look evening-ready in just 5 minutes with this hairstyle. I'll be honest, the messy bun works best with dirty hair. Let's not say dirty, shall we? Let's say not freshly washed. Most styles, in fact, will stick longer if there are a little bit of natural oils in them. 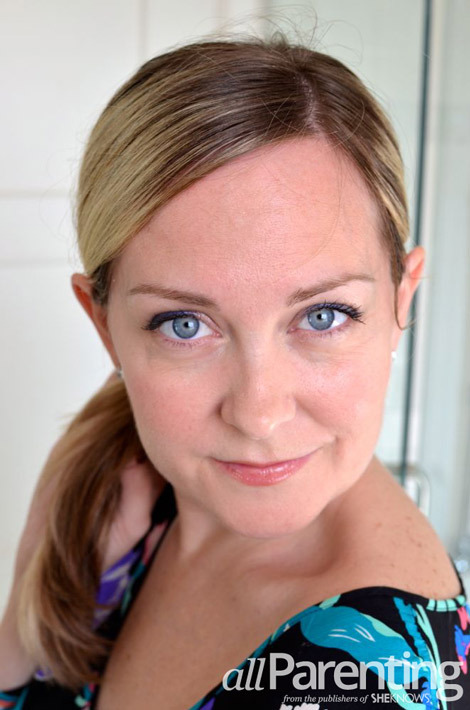 If you are attempting an up hairstyle with squeaky clean hair, spray the whole thing lightly with hairspray first. It will give it some staying power and create instant texture. I start my messy bun by parting my hair deeply to the side, but the steps are the same if you were to pull it straight back from your face. 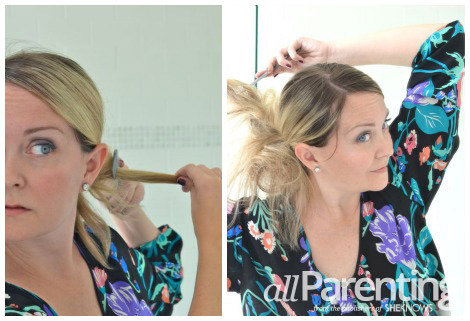 Secure all your hair into a ponytail. I like to do this right at the nape of the neck. Clear elastics work best because the messy side of this look means it might occasionally peek through. Take small sections (for fine hair, I use about a half inch, but for thick hair you'll want a larger chunk) and backcomb them as much or as little as desired. Go quickly until it's all just a giant mess back there. Don't be scared — this will help the bobby pins stay in longer and give more umph to your bun. When the ponytail is as wild as a lion's mane, gather it all together and twist. Twist and twist until it starts to naturally curl around the elastic. 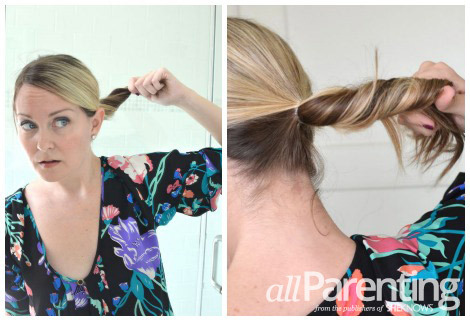 Follow the curl until you've wrapped the hair into a circle (the bun shape). Don't twist too tightly or you'll look like a ballerina and not the disheveled chic you're going for. 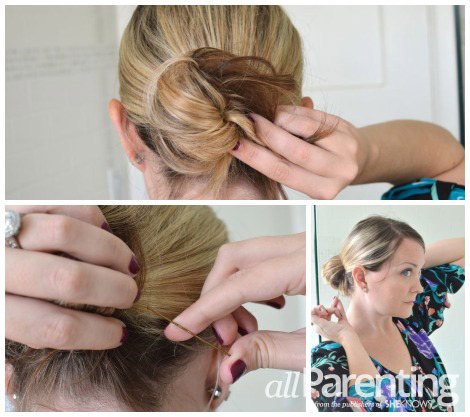 Now, holding the bun all in one hand, use the other hand to bobby pin the loose end in place. After that's secure, go all around the bun with the pins, placing one every half inch or so. You don't have to be super careful, that's what is so great about this look. Once you have pins all the way around, check and see that you don't have any stray hair sticking up or falling down. Hairspray the heck out of all of it, then give your hair a little shake so it doesn't look like a helmet. You're done! 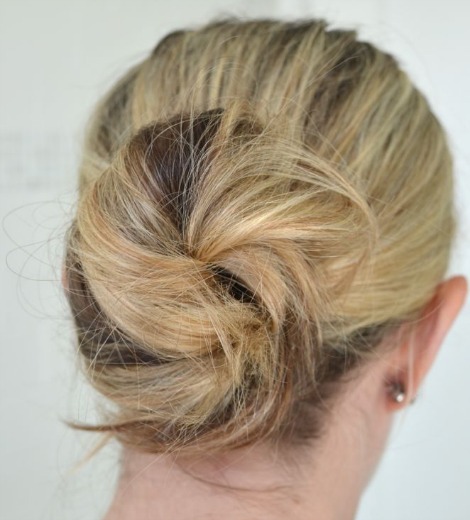 When I wear my hair in a messy bun, I usually carry a few extra bobby pins in my purse for touch ups or for flyaways. It took me several times of wearing the messy bun to find the balance between too tight and too messy. But the look is forgiving and goes with everything. I plan to wear it throughout the holiday season!